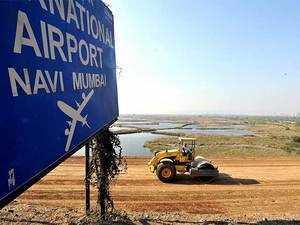 When Prime Minister Narendra Modi lays the foundation stone for the Rs 16,700-crore Navi Mumbai airport tomorrow, it will be a 21-year-old dream for the megapolis nearing realisation. With the PM laying the foundation stone tomorrow, the Navi Mumbai International Airport, being built by the state-run Cidco and the GVK Group which also runs the Mumbai international airport, is all set to take off at a humongous cost of over Rs 16,700 crore. However, the land needed for the airport -- over 2,268 hectares of which nearly 1,160 hectares will be used for aeronautical purposes -- is yet to be fully acquired. Unlike the Chhatrapati Shivaji International Airport of Mumbai which is a single-runway affair, the new airport in neighbouring Navi Mumbai will have two parallel runways, and will handle close to 80 flights an hour. It is expected to significantly ease the load of the congested Mumbai airport, which handles over 900 flights a day (the peak was 980 flights in mid-January), and is known as the world's busiest single-runway facility, accounting for almost over 25 per cent of the entire air traffic in the country. The City Industrial Development Corporation (Cidco), which is developing the new airport along with GVK Group, expects the first flight to take off in 2019. GVK Group will hold 74 per cent stake in the project, the rest being held by the Cidco and the Airports Authority of India. The parallel runways will measure 4,000 metres, each with two rapid exit taxiways. The new airport will have two entrances and exits. The southern tip of the runway will be built first as it lies at the base of Ulwe Hills, expected to be cut by December. The first phase is likely to be completed by the end of 2019, with one runway and the terminal building ready to handle up to 10 million passengers. The second phase, to be completed by 2022, will take the handling capacity to 25 million passengers. The third phase will be completed by 2027, and at the completion of the fourth phase by 2031, the capacity will be 60 million passengers. The Mumbai airport's capacity is 40 million, but since 2016 it has been handling many more passengers. The pre-development work is estimated to cost Rs 3,420 crore while the total package for compensation offered to the 3,500 project-affected families is around Rs 520 crore. The GVK Group will invest nearly Rs 4,000 crore in the first phase. Ten villages in Navi Mumbai have been impacted by the proposed airport. Until now, Cidco has rehabilitated close to 400 of the 3,500 affected families. Each family has been offered alternative plots, monetary compensation, construction aid, rent allowances and additional amenities in the Pushpak Nagar where they will be rehabilitated.